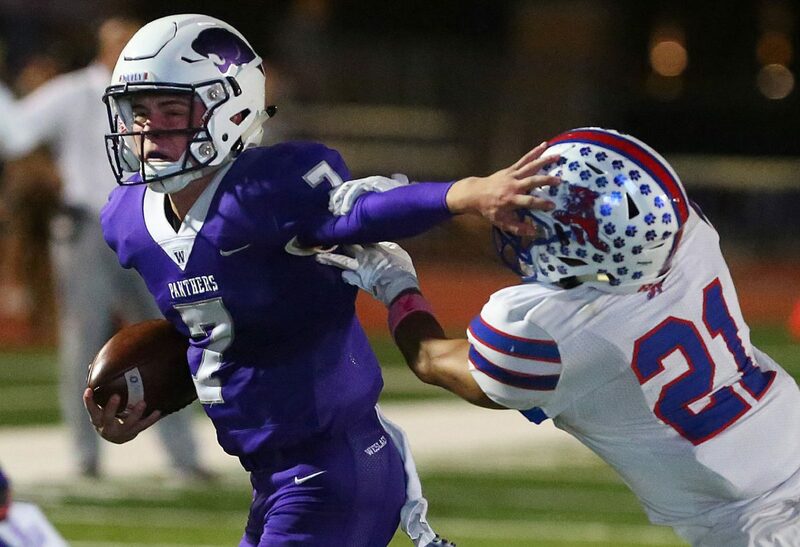 Weslaco High quarterback Jacob Cavazos (7) attempts to avoid the tackle of Edinburg High's Mannie Salinas (21) as he carries the ball in a game at Bobby Lackey Stadium on Friday, Oct. 26, 2018, in Weslaco. The Tinaco Bowl will be back at a level that has been missing in the last few years. The rivalry between Weslaco High and Weslaco East was named after the water tower in Weslaco. The water tower lights up purple for Weslaco or silver for East. There are legitimate playoff stakes in this No. 1 vs. No. 2 matchup in District 31-6A. Weslaco East (5-2, 4-0) and Weslaco High (7-1, 3-1) will meet at 7:30 Friday at Bobby Lackey Stadium in Weslaco in The Monitor’s Game of the Week. Both teams have been dominant in district. Both teams are coming off of large victories in Week 9. Weslaco East's Josh Gonzalez (2) carries the ball against Edinburg High in a game at Richard R. Flores Stadium on Thursday, Oct. 4, 2018, in Edinburg. 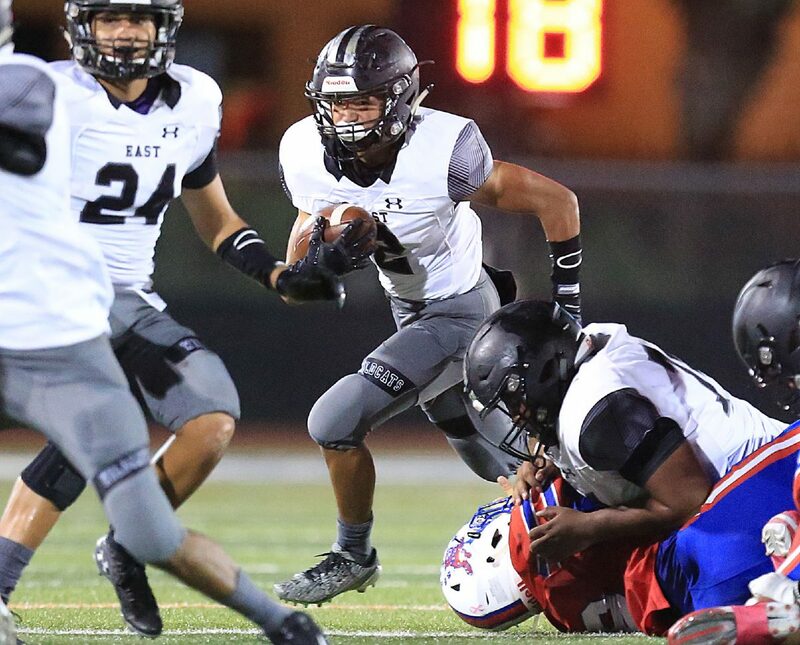 If Weslaco East wins, it sets up a district title matchup on Week 11 with Edinburg Vela, which is also unbeaten and tied for first with Weslaco East, if Weslaco High wins, the Panthers will be in line to claim the second seed. The Wildcats have the best defense in the Valley, allowing the fewest yards per game of any 5A or 6A school. Freddy Cardenas is a leader on that defense from the linebacker position, but East is loaded all over the defensive depth chart. For Weslaco High, the defense is solid as well, but what has Panthers fans excited is the play of junior quarterback Jacob Cavazos. Cavazos is second in the district in passing yards, third in rushing yards and has only thrown one interception on the year. The East offense has been inconsistent this year. The rushing attack has been potent at times, but injuries and the lack of a passing threat for part of the season have hampered the offense quite a bit. Vela may have given East the blueprint for success, as the SaberCats changed the pace and used defense and rushing to slow the explosive Weslaco High offense in their Week 7 win over Weslaco. East should be able to do the same sort of thing, but they will need to create some offense to help keep defense fresh. East may run into issues if it turns into a track meet early. If Weslaco High is looking for a roadmap to success, the Panthers will likely look to East’s two losses. The one common thread is both opposing quarterbacks threw for more than 150 yards at a decent completion percentage. The game should be intense and physical, and both teams will be putting it all on the line for the win, and the bragging rights.